Ensemble 14 Speed Blender Black. Wave-Action system pulls mixture down into the blades to create smooth drinks. Dishwasher safe 48 oz. glass jar. Stainless steel Ice Sabre blades. 14 speeds and 700 watts peak power. Price $50 Based on the manufacturer's suggested retail price (MSRP), this blender is LESS EXPENSIVE THAN AVERAGE and is priced in the BOTTOM 26% of all blenders. 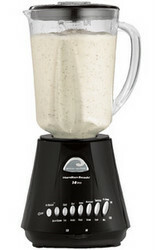 Watts The BL10450H is MORE POWERFUL THAN AVERAGE and ranks in the TOP 30% of all blenders. Stars Based on actual user experience and reviews, this blender is RATED ABOUT AVERAGE by 37 USERS when compared to all other blenders. Great blender for the money...Powerful motor, multiple settings, and not extraordinarily loud, by blender standards. I've had this blender for about a month and I am very satisfied with its performance. It does everything that it promises to do. Nice Product... Just the glass jar is a bit heavy to lift for long but quite happy with the outcome. Nice glass pitcher, crushes ice very well to make all kinds of drinks. Multi 14 speeds for all kinds of purposes. Very happy with this purchase for a great low price tag!!! I have only used this product once since I purchased it and it smells like the motor is burning up. I'm very satisfied with the blender. It crushes ice just like it promised. The large glass pitcher is nice. No problems thus far.